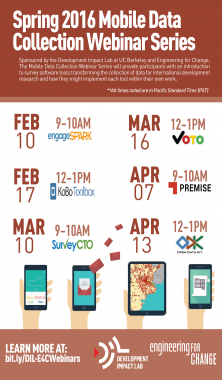 April 21, 2016 — This semester, in collaboration with Engineering for Change (E4C), the Development Impact Lab hosted a Mobile Data Collection Webinar Series to offer a first look at software tools used by development researchers to collect data, and to provide suggestions on how to incorporate these tools into participants’ own research initiatives. The webinar builds upon DIL’s efforts, including the Mezuri Platform, to advance data analytics in international development. A free, publicly available series, the Mobile Data Collection Webinar brought together leading thinkers in development engineering to share practices on solving global development challenges. DIL’s webinar series kicked off with a session introducing some of the most recent and innovative methods of data collection. Panelists included Ravi Agarwal, founder of the nonprofit engageSPARK; Tom Plagge, data scientist and co-founder of The Impact Lab; and Faizan Diwan, customer engagement lead at Dobility, Inc. Each offered diverse insights from their experiences with data collection in nonprofit, for-profit, and academic settings. A primary point of consensus among panelists regarded the widespread availability of data among underserved communities. “A big transformation has been that people are collecting more data. Organizations want this data and the quantitative results,” said Diwan. Data collection is also made easier by mobile technology, which Agarwal’s engageSPARK leverages. Panelists also discussed various challenges that arise when collecting data in humanitarian contexts. Rapid changes in on-the-ground circumstances require strict time sensitivity in analyzing and cleaning data, but setbacks occur with complex study designs, limited battery power, and low technical literacy among collectors. Plagge’s solution to these constraints involves a simple, automated tool that makes these complex decisions in order to minimize collection times. “Once you know what you want, the software and toolkit guides you on path to making intelligent choices and getting results quickly,” said Plagge. With the right software, human error can be kept to a minimum. In any humanitarian context, solid software is the key to effective data collection. Diwan made the point that, in the field, it is essential to prioritize good software that provides reliability, support, and security. Ensuring these criteria involves testing software effectively and making sure that backup options are available. “You don’t want to be tied down to certain tools given inevitable changes. It’s better to stick to tools that have open standards,” said Diwan. Doing so also entails using off-the-shelf tools over custom tools. Software that exists in the open market is not only simpler and cheaper to use, but also more reliable. By design, off-the-shelf software allows researchers to collect data without worrying about design flaws. One of the most interesting questions that panelists addressed regarded reducing human error and bias when conducting mobile surveys, particularly in regards to compliance, honesty, and completion. Agarwal acknowledged that bias in survey responses can be revealed through body language and facial expressions. He also pointed out that answers can vary based on the social status of the individual conducting the survey. Anonymity has its benefits, he argued: “When people get anonymity, they feel more comfortable and sometimes more when not faced with a person.” Agarwal also acknowledged that more testing was required to determine the viability of this theory. As the first webinar demonstrated, researchers, academics, and entrepreneurs have much to gain from the ongoing surge in mobile data collection technology. The DIL Webinar series is a means of spreading the word about the latest advances in a field that will play a significant role in the future of development research. engageSPARK’s work with MercyCorps on leveraging voice and SMS to increase saving rates in the Philippines and empowering Syrian women in refugee camps to get help in emergencies. How practitioners and researchers might leverage KoBoToolbox, a free, open source suite of tools for field data collection in challenging environments, for humanitarian response. A preview of SurveyCTO’s new capabilities (include a new drag-and-drop form builder) and how its solid foundation is built on reliability, support, and security. How VOTO Mobile, a Ghana-based tech startup and social enterprise, is changing maternal behavior and improve health outcomes through mobile education, enabling interactive radio shows to understand their reach, audience, and impact, and understanding citizen priorities via national polls. Premise’s recent work with the World Bank on collecting photos to create a real-time food-price index across 15 countries. A look at some of the success and lessons learn from Open Data Kit 1.0 (ODK) and a sneak peak at what’s to come with ODK 2.0. All recordings of this semester’s Mobile Data Collection Webinar series could be found on the DIL website. Check out Engineering 4 Change’s recap here. For additional information, contact dil@berkeley.edu. Nicholas Bobadilla is a 4th year economics undergraduate student at the University of California, Berkeley.